Information submitted in a nomination letter to the U.S. National Ski Hall of Fame by Edna Dercum and Gerald F. Groswold. Olav Pedersen started a skiing program for visually impaired people in the U.S. Launched in 1975, thousands of visually-impaired Americans have experienced cross-country skiing because of Ski For Light. Olav Pedersen was born on February 17, 1917 in Voss, Norway. Early in life, he was skiing on his first pinewood skis with toe straps. As a teenager, he won trophies in local ski club nordic competitions and was jumping from the 60-meter jump in Voss. He was active in soccer and track and field in his region and his 1938 long-jump record still stands. After finishing high school, Olav’s beginning career with the Norwegian State Railroad was changed abruptly when the German “war machine” turned against Norway on April 9, 1940. Olav joined the Resistance Movement and his skiing skills were valuable in missions to recover materials dropped from Allied planes in the remote mountains. Olav’s postwar career, until coming to the United States, included journalism, mayor of the town of Flaa in Hallingdal and chairing the organization committee for the 1955 Norwegian Nordic Skiing Championships. In 1964, Olav immigrated to the United States upon the invitation of the Breckenridge Ski Area in Colorado to teach skiing. He was a sought-after teacher with many private lessons during his 16 years of teaching alpine skiing. Olav kept strong ties to Norway and led several groups to see and ski Norway. One of Olav’s close friends in Norway, Erling Stordahl, a popular musician and entertainer who was blind, created a successful program and race for visually impaired cross-country skiers and guides, called Ridderennet at the Beitoelen Healthsport Center in Norway. 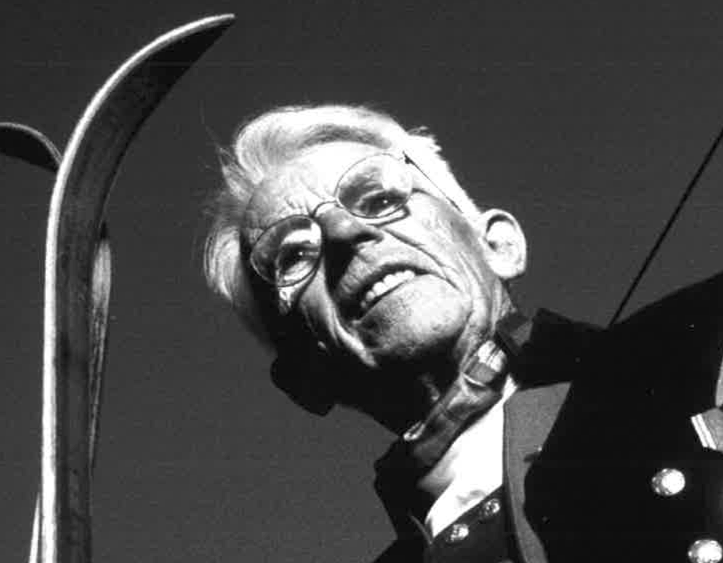 Olav Pedersen was inspired to start the same program in the United States and thus exhibited his visionary concepts for building a new dimension of the skisport in America. Under his leadership, the first Ski For Light was launched in February, 1975 in Frisco, Colorado. The first event, sponsored by Sons of Norway, Lions Club and other organizations and individuals was international in scope with participants from the United States, Canada and Norway. The Colorado governor and the Norwegian Royal Ambassador were present as well as Leif Howelsen and Anders Haugen of Colorado ski pioneer importance. Because of Ski For Light, the Norwegian government gave one million Norwegian Kroner in 1976 as a bicentennial gift to the USA to build the Vinland Center for Disabled in Minneapolis, Minnesota. Olav was a guest at the White House when the gift was presented. King Olav V of Norway presented the Order of St. Olav to Olav Pedersen in 1976 in recognition of his bringing Norway and the USA closer together through the Ski For Light program. In1997, a bronze sculpture depicting a visually-impaired skier and guide was dedicated to Olav Pedersen and Ski For Light in Frisco, Colorado. At age 70, Olav won the U.S. National NASTAR alpine ski championship in his age group. He continued to compete in citizen cross-country ski races, such as the Frisco Gold Rush. Olav also coached visually-impaired skiers heading to the Paralympics in Canada (1988) and Norway (1994). As a 1997 inductee into the Colorado Ski Hall of Fame, Olav looked back on a skiing career spanning nordic and alpine disciplines, encompassing participants both able-bodied and with disabilities. Olav Pedersen was elected to the U.S. National Ski Hall of Fame in 2000. If you notice any errors or inconsistencies in Olav Pedersen's bio, click here to let us know.